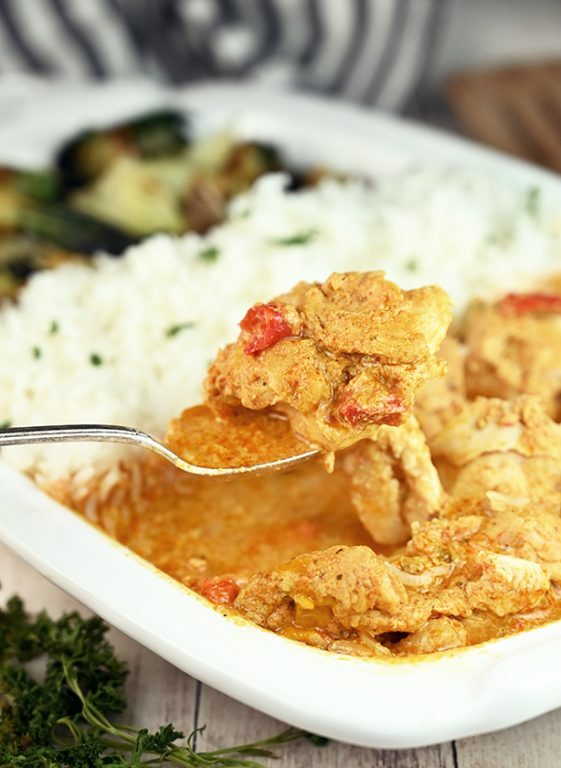 Quick and easy Thai Style Red Curry Chicken: boneless chicken thighs simmered in a red curry and coconut milk sauce. 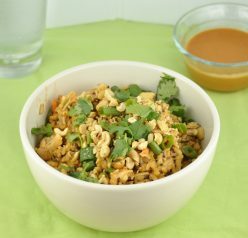 If you are a lover of Thai food you will be a huge fan of this meal! Resolution of the year: eat more Thai food. My love for Thai food knows absolutely no bounds. I have always been a huge fan of it, especially Thai Style Red Curry Chicken, and have it often. There is just something about it that is so clean and robust. In the past, I needed to eat out at a restaurant or get take-out in order to have great Thai food. It was never quite the same when I made it myself at home and I always found it somewhat challenging. This is why I was super excited to try Ready-To-Cook Thai Style Red Curry Chicken from Wegmans. With hardly any effort, you can have a restaurant-quality Thai meal right in your home. I was blown away by how authentic it tastes and how easy Wegmans makes it to get a delicious Thai style dinner on the table for your family. It is very simple to make and no preparation needed whatsoever! The small package size is great for smaller families and feeds 2-3 people. I get ridiculously excited when I can make something like this at home in my own kitchen. It’s really fantastic and it tastes fancy. In case you have not heard of them or tried them yet, Wegmans now has a line of products that are the only one of its kind in the grocery industry. 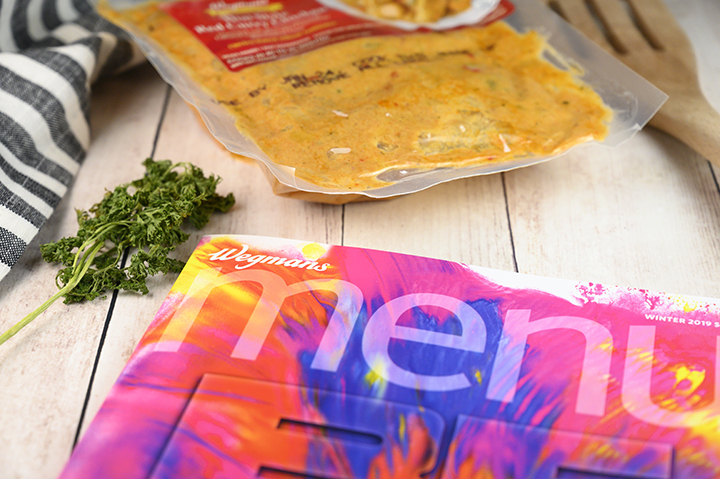 These unique items are entrées in oven-safe packaging. They are 100% food-safe and the packaging is made without added BPA. The oven-safe packaging preserves flavors and speeds up cooking times. Rest assured that the packaging is safe to cook the food in because it has been tested by the FDA and two universities with packaging science programs. With these meals, you pop them right in the oven and that is the extent of the work on your part! 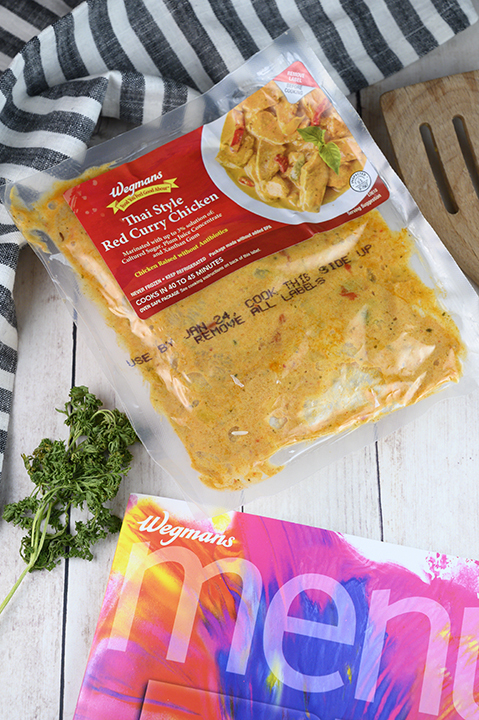 Each recipe is chef-developed and has the Wegmans Food You Feel Good About banner, meaning it contains no artificial colors, flavors, or preservatives. My new favorite of these entrée varieties is definitely this Thai Style Red Curry Chicken, but I still need to try a few more of them. I LOVED their Chicken Cacciatore that I shared with you last year. The Ready-To-Cook Sunday Sauce with Meatballs, Sausage & Pork looks and sounds amazing and is next on my list to try. 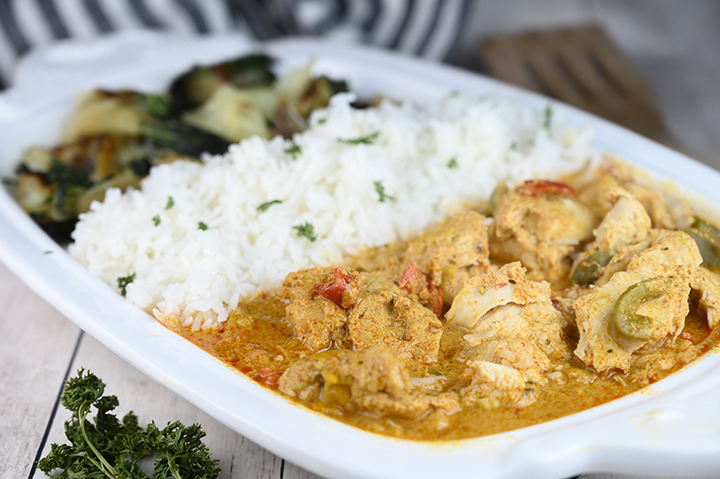 This Curry Chicken is such a comforting, multi-dimensional meal and I loved the creamy, bold coconut milk red curry sauce with just the right amount of heat from the curry! 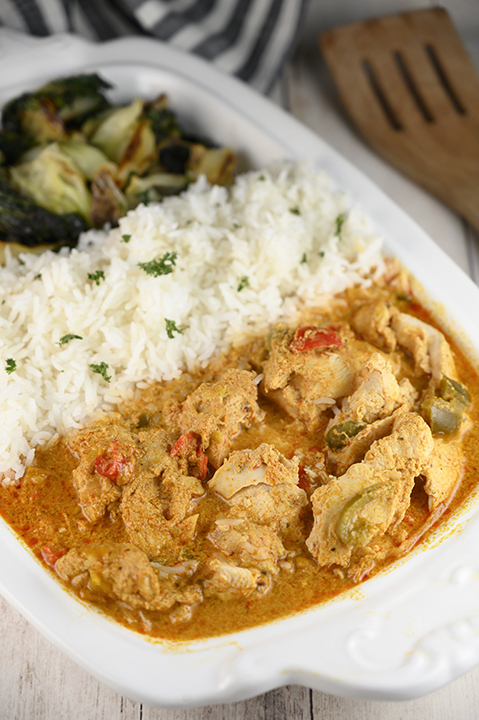 I served this Thai Style Red Curry Chicken with Wegmans organic jasmine rice and baby bok choy. It was the perfect meal! You can even serve it over cauliflower rice or use my recipe for Thai Sticky Rice if that is more your thing. So much flavor packed in to such an easy dinner! For so little time and effort, you really cannot beat this dish: delicious Thai flavors, and your house will smell incredible while it cooks. It is a perfect and light dinner that easily takes you to Thailand without leaving your kitchen. You should also check out my Thai Peanut Chicken Meatballs. Enjoy! Disclaimer: Thank you to Wegmans Food Markets for sponsoring this conversation. All opinions remain 100% my own, as always. Thank you for allowing me to share the brands and products I use regularly and love. Wow, so simple and looks amazing! It sure was! Thank you!! Love curry! This looks fantastic — nice and warming. Just the thing with the cold weather we’re having. Thanks! Yes! I love curry too! I love, love this shortcut!! Thanks so much for your recommendation—I’ll be trying it out soon!!! Thanks Liz! It’s so easy! Great lunch idea! I love Thai food too! It really is the best! 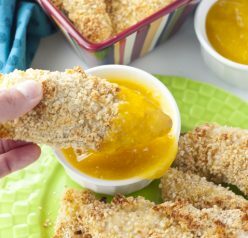 This makes a fantastic busy day meal! Yeah – it’s perfect for that! We love Thai food in this family, but rarely make it at home. Cooking asian food intimidates me because it is difficult to get right and up to par with the “experts” who grew up preparing it as part of their culture. Definitely going to have to pick this up from Wegmans soon. 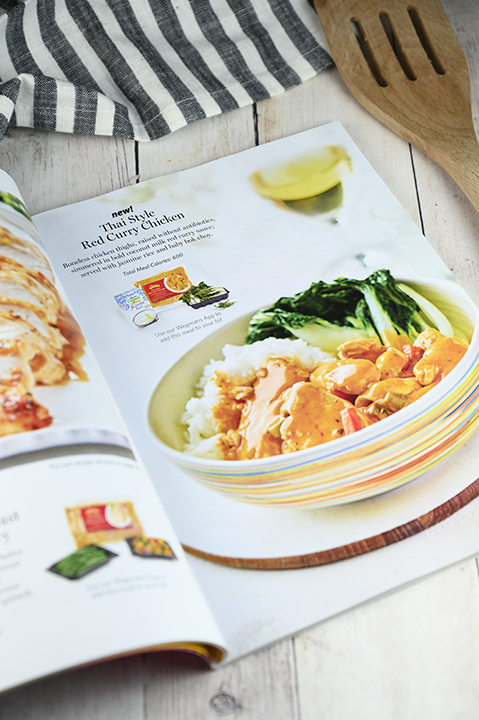 You can’t beat a fresh chef-prepared meal but without having to go out to a restaurant! This is fantastic! Love trying delicious new recipes like this one! I loved it!! I love how easy it is! And it tastes perfect! Thanks for sharing! Busy weeknights deserve some great shortcuts. And we LOVE Thai flavors! I’m excited to try this- looks great! Thai curry? 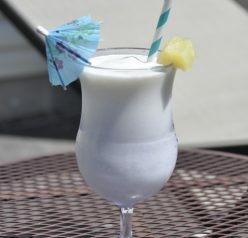 You’re calling my name! This looks incredibly good — thanks!